of Spain in New York. The serene Mediterranean coastline nestles Barcelona on one side while round green mountains frame the other. The city of 1.5 million—capital of the independent Spanish region of Catalonia—bustles in between. 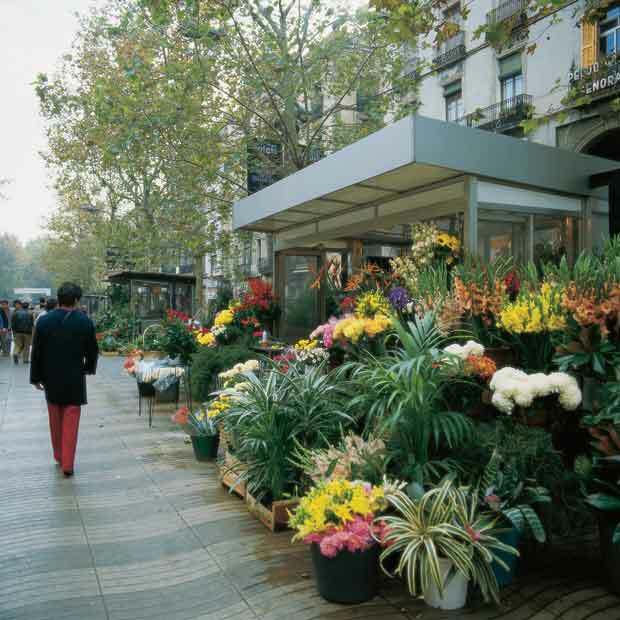 Its cultural frisson and architectural exuberance can be sampled on a stroll up from the waterfront along tree-lined Las Ramblas, the city’s best-known promenade, crammed with street performers and studded with shops, tapas bars and flower vendors. 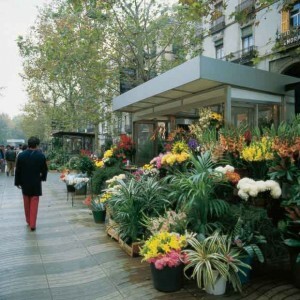 The plural form of Las Ramblas signifies that the boulevard is composed of not one but several connected streets, many of which head into distinctive neighborhoods with buildings spanning centuries and architectural styles from Roman to Gothic. For Jewish travelers to Barcelona, the joy is in seeing how, after a 500-year hiatus forced by the Spanish Inquisition’s threat of expulsion, public burning or conversion to Catholicism, Jewish life is enjoying a rebirth. Historians believe that Jews began moving to the city after the destruction of the Second Temple in 70 C.E. Responsa from Babylonian rabbis to those in Barcelona have been traced back to the 700s, and when Muslim Saracens overran the city in the early 8th century, Jews were blamed for opening its gates to them. In 801, the Saracens were driven out by the Franks, who secured Barcelona as a Christian stronghold. During the 12th century, renowned Jewish Spanish traveler Benjamin de Tudela recorded his arrival in “that small and beautiful city on the shore of the sea” and noted that a Jewish “holy community” and “mighty princes” of commerce were in residence. Jewish learning flourished in the region as well. In 1263, Moses ben Nahman (1194-c. 1270), also known as the Ramban or Nahmanides and one of the greatest Jewish scholars of the Middle Ages, was ordered from his home in nearby Girona to debate Pablo Christiani, an apostate Jew and Dominican priest. The Disputation of Barcelona was conducted before King Jaume I. Ramban was so persuasive the king is said to have praised his courage and awarded him a monetary prize. Subsequently, King Jaume did what no sitting sovereign in the Middle Ages had done before—he attended a Jewish service, probably in Barcelona’s Sinagoga Mayor. Shlomo ben Abraham ben Adret, the Rashba (1235-1310), served as the Sinagoga Mayor rabbi for 50 years, writing thousands of responsa and prohibiting the study of philosophy and science by Jewish men before age 25. Sinagoga Mayor. Photo courtesy of Urban Cultours Project. By the middle of the 14th century, Jews comprised 15 percent of the city’s population, mostly jammed into El Call, the old Jewish quarter. Here lived scholars and vintners, bakers and bankers, who prospered in the service of both Christians and Jews in the hive of commerce they dominated adjacent to the dramatic Cathedral de la Seu. On August 5, 1391, El Call was attacked. At least 200 Jews were murdered. Afterward, the synagogue and other Jewish properties passed into the hands of the king, and Judaism went underground. The church’s consolidation in Barcelona and other non-Muslim cities became so aggressive that about 100,000 Jews would leave in the coming century, prior to the start of the Inquisition. For about 4,000 Barcelonan Jews, the destruction of Jewish life and property in 1391 prompted them to become Christian. Ironically, it was the ambivalence of those who converted toward their adopted religion that angered Spain’s church leaders and prompted the establishment of the Inquisition to fortify the country’s true believers. In 1492, the most cataclysmic year of the Inquisition, about 250,000 Jews left Spain. But even after that year, some Jews who had converted continued their Jewish religious practices secretly. Obedient Christians reported these Conversos; hidden Jews gave themselves away by continuing to cook their food in olive oil and garlic, rather than the lard Christians used. After being a city without Jews for hundreds of years, in the late 1800s, Moroccan and Turkish Jews were among the first to return. The law prohibiting the establishment of synagogues was overturned in 1909. In 1918, 100 Jews lived in Barcelona. When the Spanish Civil War began in 1936 with Francisco Franco’s rise to power, about 5,000 Jews had drifted into Catalonia. And, in a historic twist that makes an otherwise brutal dictator look good, Franco’s neutral Spain provided refuge for Jews during World War II. None of the Jews who lived in Catalonia were shipped out for extermination. Fleeing from South American political repression in the 1960s, Jewish immigrants of both Ashkenazic and Sefardic origin came to settle in Spain, usually in Madrid or Barcelona. They were aided by a kind of Spanish law of return directed at citizens of Spain’s former colonial dominions. Apparently, immigration of Ladino speakers was particularly encouraged. The Holocaust memorial atop Mountjuic. Photo courtesy of Urban Cultours Project. In Spain today, more than 20,000 out of a total population of 43 million consider themselves Jewish. Three quarters of those affiliated belong to Orthodox congregations on the Spanish peninsula—in Barcelona, where around 5,000 Jews reside, Madrid, Valencia, Palma, Alicante and Malaga. In 1954, the Comunidad Israelita de Barcelona (Carrer de Avenir 24; 011-34-93-200-85-13) built the first freestanding Jewish institution on the Iberian Peninsula since the expulsion; it is Orthodox in practice. Barcelona became home to the first Reform congregation in Spain in 1997: The Comunitat Jueva Atid holds Shabbat morning services in the Sinagoga Mayor at Carrer Marlet 5 in El Call but is actually housed at Carrer de Castanyer 27 (93-417-37-04). The congregation has 400 members, most of Argentine descent. The Chabad Lubavitch Center for Jewish Studies is a somewhat recent addition to the city (Calle Joan Gamper 27; 93-410-06-85; www.chabadbarcelona.org). The community also claims a Jewish publishing firm called Rio Piedras, which specializes in Jewish Spanish history; Sefardic cooking classes; concerts of Ladino and klezmer music; and an international Jewish film festival. The high point of a visit some years ago to Barcelona was the “rebirth” of five Conversos at Sinagoga Mayor. Rabbi Ariel Edery read excerpts from the 15th-century Siddur de los Conversos Catalanos, written in old Catalan and Hebrew, which was unearthed during the synagogue’s excavation. At Shabbat morning services, the men, formerly Catholic, completed their conversion to Judaism by being called up to the Torah to chant their first aliyot. They had traced their lineage back centuries to Spanish Jewish ancestors. In El Call (the name may come from an old Catalan word derived from the Hebrew kahal, community), Hebrew inscriptions dating from at least the 14th century can be made out—just barely—in the stone walls. Near the cathedral on San Jaume Square, the Hebrew letters nun, vet and tav can be coaxed out of the bricks. Most of the letters are so faded it helps to have a guide point them out. To that end, community leader Dominique Tomasov Blinder, an architect originally from Argentina, runs Urban Cultours (www.urbancultours.com), an outfit specializing in tours of Jewish Catalonia. Carrer Marlet, like most of El Call’s streets, is a medieval passageway only wide enough for pedestrians to squeeze by one another. Most of the original buildings were torn down after the expulsion, their materials recycled into edifices elsewhere in the city. The remaining tall, narrow stone structures where Jews once lived and ran their shops are stark and simple, built from pale gray limestone mined from nearby Montjuic. Their lack of ornamentation is a sharp contrast to the Gothic laciness of the cathedral, built when El Call was a bustling center of commerce. Montjuic, which means either Mountain of the Jews in old Catalan or, according to some ethnically cleansed guidebooks, Mountain of Jupiter, rises on the south side of the city by the harbor. It can be reached by the cross-harbor cable car from the seaside neighborhood of Barceloneta or by taxi and bus No. 61. The 1992 Olympics were held in a remodeled stadium on the mountain. But Montjuic, apart from its name, has particularly Jewish significance. A Jewish cemetery had been there for at least a millennium. More than 500 gravestones have been found, and 140 of those facing east date to about 1034. Some of the early tombstones have been relocated to the Castell de Montjuic (93-329-86-13), a 17th-century fortification that is now a military museum. 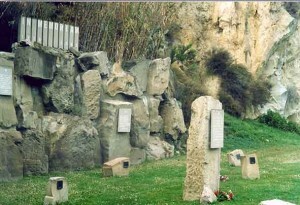 In 1995, a few Barcelona Jews erected a Holocaust Memorial in the cemetery on a plot donated by the city. The memorial is composed of simple stone monuments and pedestals with the names of all the concentration camps that were liberated. One place where Jewish history seems sorely lacking is at the Museu d’Historia de La Ciutat (City History Museum of Barcelona;www.museuhistoria.bcn.es) on the Placa del Rei. The museum’s elaborately documented, excavated archaeological subsoil reveals, but only to the sharp-eyed, Hebrew letters carved into one of the ancient exposed walls. No plaque marks the spot, and an exhibit overview makes scant mention of the Jewish quarter. At the Museu d’Historia de Catalunya (Museum of Catalonian History; www.mhcat.net), in the Palau del Mar off Passeig Joan de Borbo, the region’s history is exhaustively covered, but only one or two displays mention the Inquisition: None depict Jewish life in Barcelona. Also just outside El Call on Carrer Montcada is the Museu Picasso (93-256-30-00; www.museupicasso.bcn.es),rambling through several sumptuous medieval palaces. The collection of his work from age 10 to 14 and the salon of more than 50 Cubist variations of Diego Rodriguez de Silva y Velazquez’s Las Meninas should not be missed. Gaudi’s Parc Guell. Photo courtesy of Tourist Office of Spain in New York. 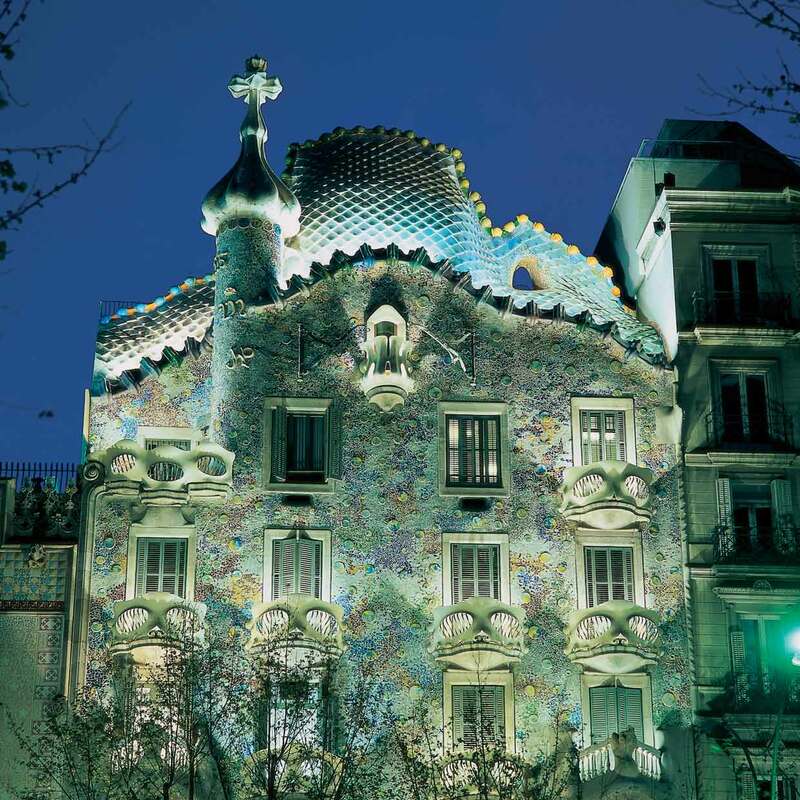 Moving still farther away from the city’s Jewish sources are the works of Antoni Gaudi, the early-20th-century Art Nouveau architect and Barcelona native. 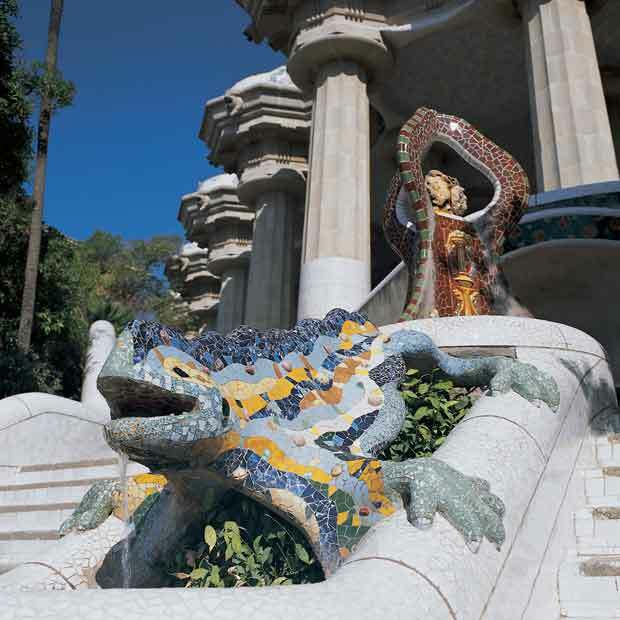 Gaudi was wildly playful with stone and wrought iron. He designed everything from whimsical lampposts and balconies to the colorful, undulating Casa Mila, also known as La Pedrera, the quarry” (90-240-09-73;www.lapedreraeducacio.org), and Casa Batlló (93-488-06-66; www.casabatllo.es both apartment houses along the elegant Passeig de Gracia. The brightly tiled Parc Guell overlooking the city and the sea, and a dozen or so other sights, illustrate Gaudi’s unique vision of nature and urbanity. His Sagrada Familia (93-207-30-31; www.sagradafamilia.org), a cathedral between Carrer de Mallorca and Carrer de Provenca, looks like a gigantic construction site. 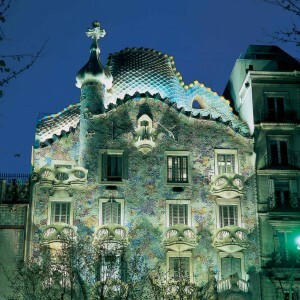 Indeed, it has been a work in progress since Gaudi’s death in 1926. To pick up the trail of Catalonia’s Jewish past, drive about an hour northeast of Barcelona to the walled city of Girona, situated along the rivers Ter and Onyar. Jews lived here for 600 years, starting in the 9th century, in relative peace under royal protection in exchange for direct payments to the reigning monarchs. Indentations in doorposts along the streets of Girona’s Call are visible reminders of the mezuzas once mounted on them. Girona was a renowned center of Jewish learning in the 13th century. Kabbala’s first appearance in Spain was in Girona, where scholars including Nahmanides had a decisive influence on the development of Jewish mysticism. Today, the Call de Girona Municipal Board oversees the preservation of the city’s Jewish past; its headquarters are in the Bonastruc ça Porta Centre (www.ajuntament.gi/call/eng), the building that housed Girona’s last synagogue in the 15th century. 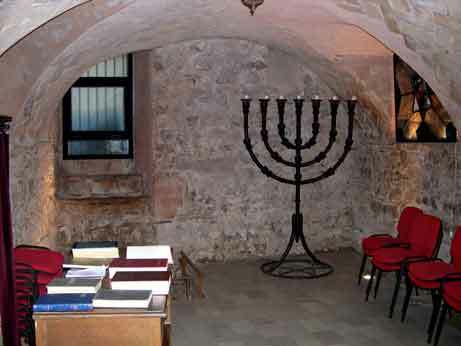 Currently, it is home to the Museum of the History of the Jews and the Nahmanides Institute for Jewish Studies. Histories of Spain’s Jews abound. Howard Sachar’s Farewell Espana: The World of the Sephardim Remembered (Vintage) and Jane Gerber’s Jews of Spain: A History of the Sephardic Experience (Free Press) are among the most popular. In George Eliot’s novel Daniel Deronda , the hero Daniel is descended from wealthy Jews who once lived in the town of Ronda in southern Spain. Daniel becomes a spokesman for Zionism 20 years before Theodor Herzl. Both David Ben-Gurion and Chaim Weizmann credited Eliot’s classic with helping fuel their Zionist passion. Reflecting its history as a medieval center of learning, Catalonia’s best-known Jews were scholars. In addition to Nahmanides, the early-12th- century mathematician Abraham ben Hiyya is thought to have aided the court in apportioning territories conquered from the Muslims. And in the 14th century, Rabbi Nissim Girondi helmed the Barcelona yeshiva, where his disciples included Rabbis Isaac ben Sheshet and Hasdai Crescas—members of old and respected Barcelonan families—who went on to take part in communal affairs as well. The controversy over Christopher Columbus’s possible Jewish ancestry and Catalan birth remains a lively debate among historians. Recent (and inconclusive) DNA tests on bones that may have been Columbus’s and of those of his son, Hernando, have only added to the mystery of his ethnicity. Kosher meals may be ordered in advance from Chabad and from Comunidad Israelita de Barcelona. Vegetarian tapas—savory dishes smaller than entrées—can be ordered at major tapas bars. The Catalan specialty pa amb tomaquet is made from slightly stale bread rubbed on both sides with garlic, drizzled with olive oil and tomato pulp and sprinkled with salt. The Hotel Majestic (Passeig de Gracia 68; 93-488-17-17; www.hotelmajestic.es) is just steps away from Las Ramblas and less than 10 minutes on foot from El Call. As Barcelona’s Jewish past is brushed off and displayed, it is the city’s Jewish present that continues to emerge. Each year there is some new addition for visitors to appreciate. This story originally appeared in the March 2006 issue of Hadassah Magazine.